FRISCO, TX--(Marketwire - Sep 11, 2012) - While many TV professionals suspect that spending more time watching programs on non-TV platforms like iPads means spending less time watching "regular" television, just the opposite is the case. According to new research from TDG, 88% of adult tablet owners use the device to watch video, with television programs ranking high on their content list. This is proving to be a major concern among TV broadcasters troubled that pad-based viewing may cannibalize high-value prime-time television viewership. New TDG research suggests this concern is ill-founded. Among 18-49s that use their pads to watch online TV programs (a key TV demographic), 39% report that their pad viewing has led to an increase in regular TV viewing. 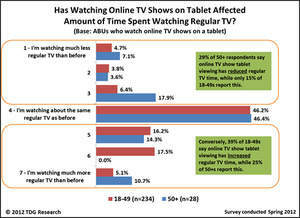 Otherwise, 46% report no change and 15% report a decrease in regular TV viewing. Even among 50+ users, the net impact is close to zero. "This is a conclusion of particular relevance to those involved in the TV industry including networks, multichannel operators, and advertisers," notes Bill Niemeyer, TDG Senior Analyst. "The data clearly shows that watching online TV shows on a tablet drives greater TV viewing among the highly-desired and increasingly hard-to-reach 18-49s." Pad diffusion is set to ramp quickly with the introduction of mid-market pads with compelling functionality and mass-market pricing such as the new lineup of Amazon Kindle Fire tablets, meaning more consumers will be using pads to watch video -- whether over WiFi or mobile high-speed networks, and whether in or out of the home. This reality is not lost on TV broadcasters and multichannel operators concerned about the impact these emerging habits might have on "regular" television advertising. "At the moment, this is a win/win for TV networks that can monetize tablet viewing via advertising, pay-per-view, or subscription OTT revenue, while at the same time reaping the benefits of increased viewing of their regular TV programming." The extent to which this accretive trend continues is a key focus of TDG's ongoing consumer research. This data is featured in TDG's latest report, Video Behavior Among iPad/Tablet Users - 2012. For more information, visit www.tdgresearch.com or contact our Research Services Team (sales@tdgresearch.com) now at 469-287-8050. TDG provides actionable intelligence on the quantum shifts impacting consumer technology and media behaviors. Since 2004, our market research and advisory services have helped technology vendors, media companies, and service providers understand how consumers access, navigate, distribute, and consume broadband media -- whenever and wherever they may be.